Masking objects can be one of the most tedious tasks in Photoshop. I have tried several masking programs which are supposed to speed-up the process but they never lived up to the hype. Either the results were disappointing or incomplete, leaving a jagged edge or they took so much time it that it would have been quicker to use the direct selection tool in Photoshop. 1. 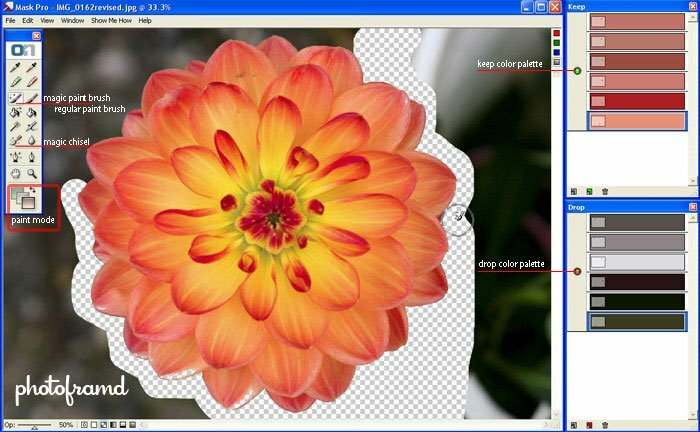 Mask Pro uses colors to control the way the “magic” tools operate. Start with the Green Dropper and select the colors you want to keep. Then use the Red Dropper and select the colors you want to drop. Once your colors are selected, just use the Magic Paint Brush, change the paint mode to red for delete and start brushing the background away. 2. Touching up the mask is just as easy. You will notice that I removed some of the inside of the petal. Just change your brush to the regular Paint Brush (the one without the sparkles), change the paint mode to green for restore and start painting. 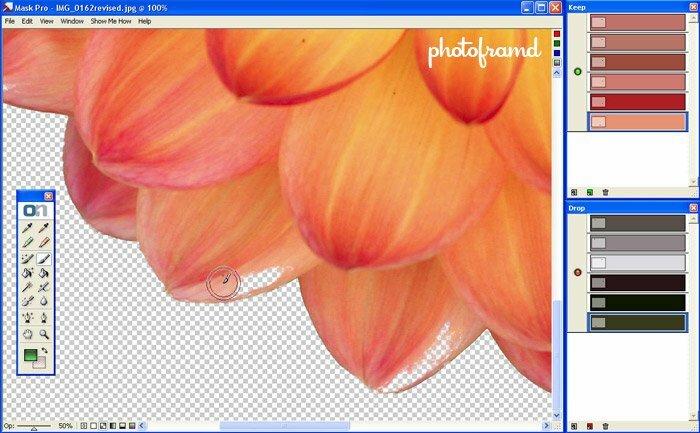 You can quickly adjust the size of the brush by using the brackets [ ], just like in Photoshop. 3. Use the Chisel Tool to perfect the edge. Anti-aliasing can make a mask edge look fuzzy and unnatural. The Chisel Tool allows you to remove the semi-transparent pixels, creating a nice sharp edge. Just select the Magic Chisel Tool, change the paint mode to red and start painting. Try to cover the entire edge in one pass to be sure that it is even. An additional pass with remove more of the edge. 4. Finish by selecting File > Save/Apply. 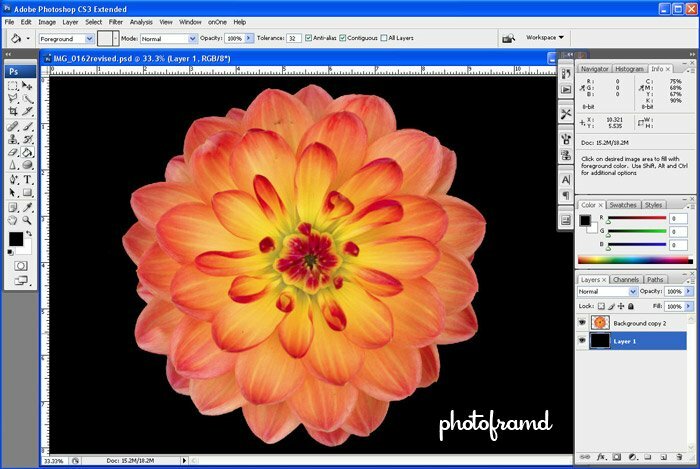 Mask Pro returns you to Photoshop with your perfectly masked image in a few minutes! NOTE: Mask Pro will not work on a Background layer. 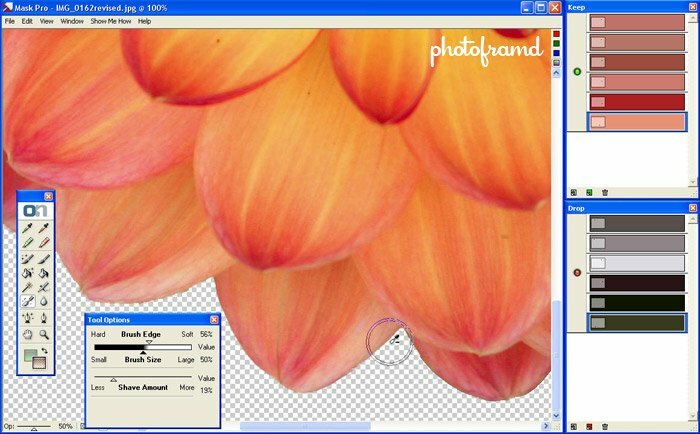 You will either need to duplicate the Background or rename the Background in order to use it in Mask Pro. But, once you start using it, you too will be hooked!